A alarming piece of news is that not only are undergrads coming out with five-figure debt, but the Chronicle reported in January that some graduate students have racked up six-figure debt — $190,000 and $250,000, as graduate students combine student loans with credit-card debt. How did this happen? I dunno. Many universities like mine have been offering five-year packages to help defray costs. But clearly this is not enough. 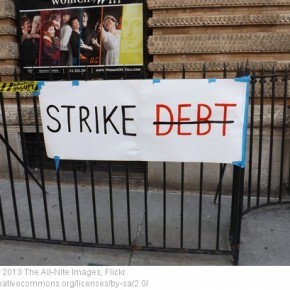 And what I do know is that it’s time we all paid attention to this debt crisis. And that rather than throwing the baby out with the bath water (getting rid of Ph.D. education in humanities or humanistic social sciences, which is fundamental for democracy as Martha Nussbaum so aptly shows), these fields should start tackling the problem. While this is a heavy lift, surely prospective students and parents along with graduate students, and faculty could help administrators out, and work as a critical collective. After all, both student and faculty governance operates, or should operate, on the basis of consensus. I wonder what Hillary’s position is on student debt? Even if students don’t vote (when they could), their parents do, don’t they? We know what action Obama took on student loans giving them to the Department of Education rather than letting all those profits go to private banks. We can only hope Hillary can see the salience of this issue for 2016.